The term "playshops" was coined by my prolific artist daughter Millie when she was 10. As she always has, she joined us on a two-day bookbinding course with all the adults. She enjoyed it so much and said "That doesn't make sense, they shouldn't be called 'workshops', they should be called 'playshops'!" The name stuck and we continue to use it as a way to keep focus on the enjoyable sharing and learning environment we get at these events. Sign up for my newsletter to hear about upcoming events and workshops. I teach frequent workshops on different topics in the UK. 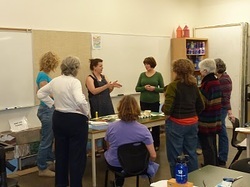 I also teach at mixed media art conferences and events at different locations, again about three times a year. I am always available for school and community projects. "Loved that weekend... My favourite is the tag book. It starts to be more fun as a form. And the skewer book too; it's a great idea..."
"Thanks for an amazing workshop! I'm inspired, I learned so much and I had so much fun. It was jam packed full. You are so generous with your knowledge, thank you!!" "Thanks so much Dea for sharing your knowledge, time and wit with us this past weekend! . . . . It’s a great way to have an artists’ retreat and to learn something new whilst in the company of kindred spirits!"